There’s treasure all around us. Here’s how to find yours! Betty Liedtke is an award-winning newspaper columnist and the Founder/CEO of Find Your Buried Treasure™. Her mission in life is helping people to see the gifts, skills, strengths, and talents they don’t even realize they have, and inspiring them to use these gifts to change their lives and the world. A survivor of cancer and severe heart damage from chemotherapy, Betty has learned to always look at the bright side of any situation or experience, even when she has to dig to find it. Chapter 2, The Pretzel Pose: Push, pull, and stretch. Work a little harder, and reach a little farther, but don’t do anything that hurts. Chapter 9, Nothing to Fear: Never get so caught up in thinking about life’s dangers that it keeps you from enjoying life’s many delights. Chapter 14, Fortune Cookie: It’s a gift to see beauty in everyday things. Treasure this! Find your wisdom, opportunity, inspiration, and determination. 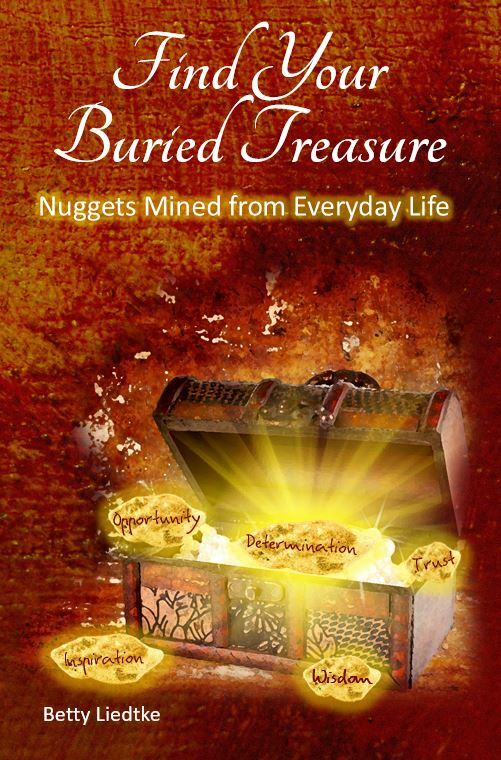 Find YOUR buried treasure today!